VMware vSAN is a software-based storage solution for VMware hyperconverged solutions. Embedded in the hypervisor and leveraging industry-standard servers, vSAN delivers flash-optimized, high-performance compute and storage for hyperconverged infrastructures.3 vSAN provides easy scalability and seamless integration with the entire VMware stack, including VMware vSphere, making it a simple storage platform for virtual machines and ideal for business-critical applications, virtual desktops, IT operations, or remote IT applications. The solution scales from two to 64 nodes, and aggregates locally attached storage into virtual data stores available to any VM in the hyperconverged cluster (see Figure 2). All-flash architecture—Delivers maximum performance and consistent low latency through flash-based caching and SSD data persistence. Quality of service (QoS)—Automatically limits and monitors IOPS consumption, eliminating noisy neighbor issues. Self-tuning—Automatically rebuilds and rebalances storage to align with QoS limits. Data reduction, deduplication, and compression—Optimizes storage capacity with as much as 10x data reduction while having minimal impact on server CPU and memory resources. Management—Enables simplicity of management through the vSphere Web Client for storage, compute, and networking in a single, tightly integrated interface. Security—Secures data with native FIPS 140-2 validated encryption. The Western Digital Ultrastar DC SN620 family features a native PCIe Gen 3, x4 interface and NVMe 1.2 compliance with in-box driver support and a comprehensive set of features making them ideal to integrate with existing infrastructures. The Ultrastar DC SN620 family includes Western Digital’s Guardian Technology Platform for improved flash endurance and data integrity protection. The SSDs provide performance, endurance, reliability, and affordability in a single package. Western Digital optimized the Ultrastar DC SN620 for mixed-use application workloads such as databases and online transaction processing (OLTP), email, virtual desktop, and collaboration where performance and high availability are required. 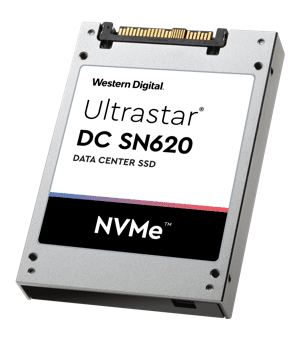 Ultrastar DC SN620 NVMe SSDs typically draw less than half the power required for performance SSDs and provide up to 250,000 IOPS random read and up to 47,000 IOPS random write performance, with up to 1,700MiB/s read and up to 1,200MiB/s write speeds. Available in capacities of 1.6 TB-3.84 TB5 , Ultrastar DC SN620 SSDs provide enterprise-class endurance, with up to 1.7 drive writes per day for five years. Performance—Each compute node supports up to two of the latest Intel Xeon Scalable processors (maximum 205W), 3TB DDR4-2666Mhz DRAM in 24 DIMM slots, and up to 12 hot-swappable 2.5” NVMe drive bays. Density—The BigTwin supports up to four hot-swappable compute nodes in a 2U form factor, as well as Supermicro I/O Modules (SIOM), providing flexible network configurations including 1G, 10G, 25G, or 100G Ethernet, or 100G InfinBand/Omni-Path while still providing two low-profile PCIe x16 expansion slots per node. Efficiency—The BigTwin reduces power consumption through shared cooling and power design utilizing redundant hot-swappable 2200W high efficiency (96%) power supplies. ESG Lab performed hands-on evaluation and testing of an SSD-based VMware vSAN at Western Digital’s facilities. Testing was designed to demonstrate performance and cost-efficiency using industry-standard tools and methodologies. Results were analyzed and compared between the SAS and NVMe vSAN configurations. For the SAS configuration, tested earlier on a different hardware platform7 , each physical node was configured with six drives, split into two disk groups of three drives each. Each disk group was composed of two 4TB Optimus Max SAS SSDs for storage capacity, and one 800GB Optimus Ascend SAS SSD for write acceleration. For the NVMe configuration, each physical node was configured with six drives, split into two disk groups of three drives each. Each disk group was composed of two 3.84TB Ultrastar DC SN620 NVMe SSDs for storage capacity, and one 3.2TB Ultrastar DC SN620 NVMe SSD for write acceleration. Twelve virtual machines, two per physical server, were running Microsoft Windows Server 2016 and Microsoft SQL Server 2016. Each VM was configured to have 16 virtual CPUs and 96 GB of RAM. The tests simulated a typical OLTP workload using HammerDB, an industry-standard, open source database load testing and benchmarking tool. HammerDB was designed as a load testing tool to compare the relative performance of OLTP databases. The implementation is intentionally non-optimized, focusing on producing reliable, scalable, accurate, repeatable, and consistent results. The workload itself emulated the database activity of users in a typical online brokerage firm as they generated trades, performed account inquiries, and executed market research. The workload was composed of ten transaction types with a defined ratio of execution. Four of the transactions performed database updates, and the rest were read only. Each of the twelve VMs was configured for 5,000 HammerDB warehouses. Twelve separate HammerDB instances, outside the vSAN cluster, acted as workload generators, and each instance was configured with 256 users, for 3,072 total users. ESG Lab started the test with a five-minute ramp to reach steady state operations. Once steady state was achieved, the test ran for 30 minutes. The performance of the system, measured in the number of new orders per minute entered into the database (NOPM), is shown in Figure 4. The SAS configuration achieved more than 2.5 million new orders per minute, demonstrating the enterprise-class performance achievable with a four-node VMware vSAN cluster using Optimus Ascend SSDs for write acceleration. The NVMe configuration delivered almost 3.4 million new orders per minute, 25% more performance than the SAS configuration. 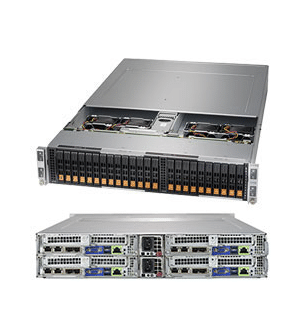 Using Ultrastar DC SN620 NVMe SSDs enabled the VMware vSAN cluster to maximize performance. Next, ESG Lab explored the performance for each individual VM to learn more about how total load was distributed across each node. We observed maximum performance for the SAS configuration with eight VMs and 2,048 total users, with an average of more than 317,000 NOPM per VM. However, adding an additional VM decreased performance, indicating that the SAS configuration was saturated. We observed maximum performance for the NVMe configuration with 12 VMs and 2,072 users, with an average of almost 283,000 NOPM per VM. 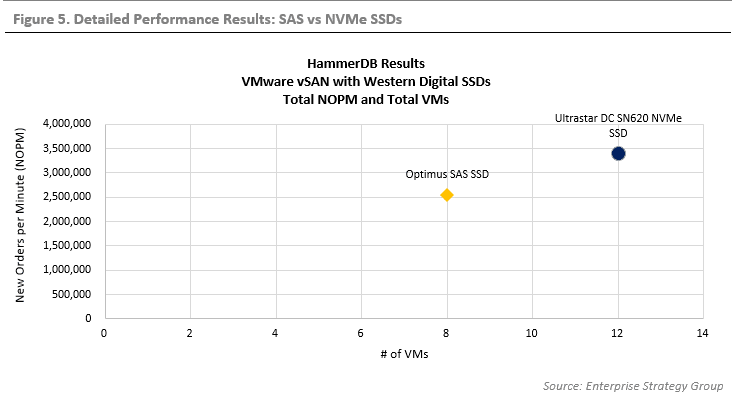 While the SAS solution was able to sustain a slightly higher average NOPM per VM, the NVMe solution sustained significantly more total NOPM and VMs using the same number of SSDs. This indicates that the NVMe SSDs provide more performance per drive, and the same number of drives can support 50% more clients. The results are shown in Figure 5. 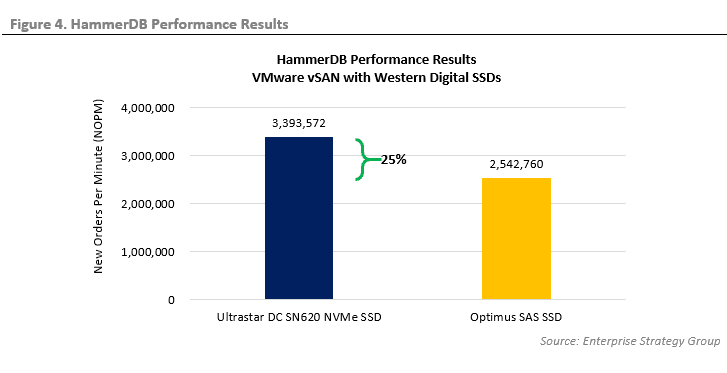 Next, ESG Lab evaluated the price of performance when using Western Digital NVMe SSDs in the VMware vSAN cluster. Using street prices for the cost of the Supermicro BigTwin, software licenses, and Western Digital SSDs, ESG Lab computed the cost of each solution, and the performance per dollar, as shown in Figure 6 and Table 1. The NVMe solution delivered 25% more NOPMs than the SAS solution. The NVMe solution was 26% less expensive than the SAS solution. Combining price and performance, the NVMe solution was 44% lower for NOPM/$, reflecting the price and performance advantage of a Western Digital-powered NVMe vSAN solution. It would take an additional $71,500 investment in a SAS solution to achieve the NOPMs of the Western Digital NVMe solution. Mission-critical database applications serve as the lifeline of many organizations and, therefore, ensuring their performance is critical. In fact, performance issues remain a key concern preventing organizations from virtualizing mission-critical database applications. This hesitation is due to the perception that virtualization not only adds overhead but will also prevent performance scalability. ESG Lab confirmed that a VMware vSAN cluster with Western Digital SSDs easily accommodated the performance requirements of an enterprise-class virtualized OLTP database environment. Performance was excellent for a SAS configuration, while the NVMe configuration delivered 25% better performance. The NVMe solution was able to support 50% more clients with the same number of drives, highlighting the performance advantage of NVMe. 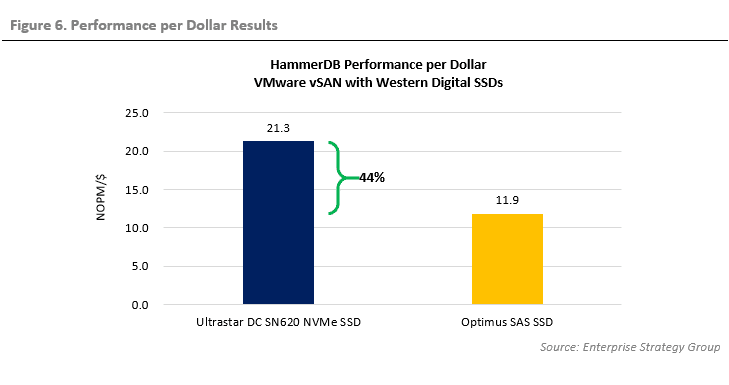 In addition, ESG Lab confirmed that the performance per dollar advantage of NVMe SSDs translated directly to the VMware vSAN with Western Digital NVMe SSD solution. The NVMe solution cost 26% less and delivered 25% better performance, resulting in a 44% advantage in performance per dollar. 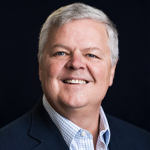 Digital transformation, the shift to cloud architectures, and the ever-increasing volume and velocity of data are putting increasing demands on IT infrastructures. 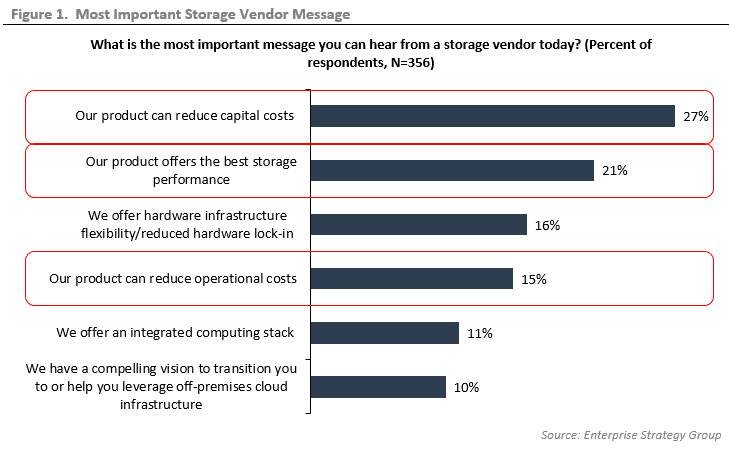 As a result, IT professionals face multiple storage system challenges—data protection, rapid data growth rates, management and optimization, and performance—while struggling to meet the omni-present mandate of doing more with less. The VMware vSAN solution with Western Digital SSDs and Supermicro servers enables IT organizations to simplify all aspects of their operations. The physical resources are aggregated into an efficient, high-density cluster. Each node becomes a simple building block to easily scale up and scale out with the business. The distributed-everything architecture leverages a software-defined approach that aggregates all storage resources across the cluster and offers all the storage services that users have come to expect in enterprise infrastructure environments. And for enhanced performance, higher endurance (>1DW/D) Ultrastar DC SN620 NVMe SSDs deliver write acceleration while lower endurance (<1DW/D) Ultrastar DC SN620 NVMe SSDs add storage capacity. 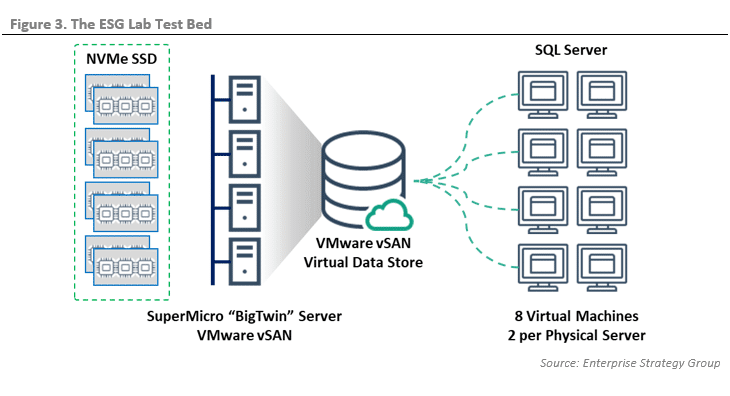 VMware vSAN with Western Digital NVMe SSDs proved to be robust, flexible, and responsive, delivering major value in terms of performance, economics, improved response times, high availability (HA), and easy administration. ESG Lab firmly believes that it would benefit any organization considering or implementing an IT virtualization project to take a long look at VMware vSAN with Western Digital NVMe SSDs and Supermicro servers.